No list of Hà Nội’s best reading spots would be complete without a mention of the BFree library. Founded three years ago, the cosy space crammed with books is tucked down an alley off Xuân La Road, in the Tây Hồ District of the capital city. 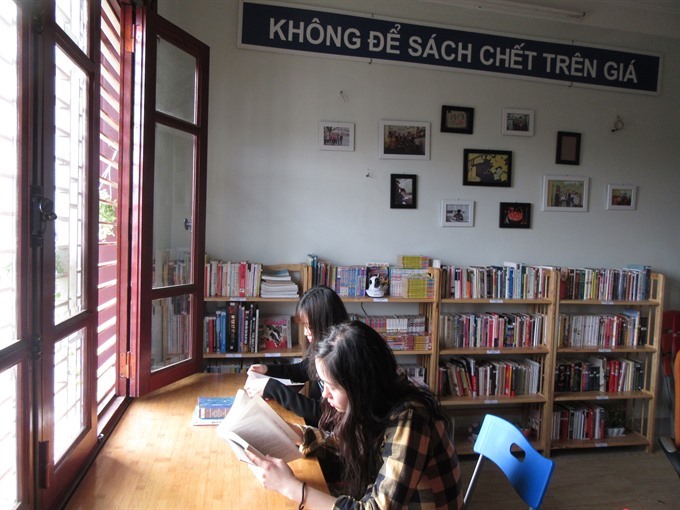 The mini-library has been listed in Ha Noi’s top five best places to borrow books for free, on toplist.vn. After having faced a number of difficulties in getting the project off the ground, the group behind BFree has succeeded in turning it into an attractive spot for local and foreign bookworms of all ages. “We want to encourage more young people to read, and to offer books to those in need,” says 26-year-old Nguyễn Trường Giang, CEO and founder of the library. Giang, who works at the Hà Nội-based Museum of Military History, founded the library in July 2014 and has since then spent most of his time and energy seeking out good books and encouraging people to donate their books to the project. The name BFree comes from the concept; ‘Books for Free’. “Đừng để sách chết trên giá” (Please do not let the books die on the shelf). This has become the motto, and raison d’être, for the group of five behind the library, where anyone can come to read and borrow books for free. The community-based library has tried hard to bring books closer to the people, in particular young people. Since its foundation, the library has gathered more than 3,000 books which have been offered by organizations and individuals. Of those, 1,800 books have already gone to those in need. The remaining 1,200 books, across a range of subjects, including history, literature, technology, foreign languages, and soft skills are available at the library. Most of them are written in Vietnamese. The idea had been brewing in Giang’s mind for a long time, but he was able to realise his dream only 3 years ago. “I love books. I used to read lots of books when I was younger. And ever since my childhood, I wished I could have a library in my house, so that I could store a lot of books, read them often and smell the pages,” he confides. “When I began my studies at university, I used to go to Đinh Lễ street to look for interesting books,” he says. However, Giang admits, reading at home often made him sleepy. He wanted to get out and read in light, calm, and spacious places. Three years later when he began his professional life, he travelled and recognized the lack of interest in reading amongst Vietnamese people. “The more I travelled, the more I met people, and the more I saw that many Vietnamese people were not interested in reading books,” he continues. “I observed, at train stations and airports, that there is a difference in the habits of foreigners and Vietnamese people. Many foreigners read books while waiting for the bus or the train. But instead of reading books, Vietnamese people occupy themselves with games or chatting on their smartphones,” he says. Giang was determined to create a library where everyone could borrow books for free — a place to encourage people to read and connect with each other. In the beginning, Giang was offered two free spaces for his library at Trịnh Ca café on Tô Hiệu street and Nghỉ café on Duy Tân street. Eventually, he was able to find his own spot, at number 4N5, in alley 40 off Xuân La road. The little library occupies the fifth floor of a house, leased for free by the landlord. Sunshine streams through the window, and books line the walls. At the library, Giang and his teammates often organise conferences and meetings between talented writers and readers, encouraging them to read more. They have also offered books to readers in remote regions. “It’s an interesting library, I can find a lot of books on Vietnamese and foreign literature that I love reading. I first found out about this place from my friends, and I’ll come here often,” says Đỗ Thị Lan, a student at the Hà Nội University of Culture. 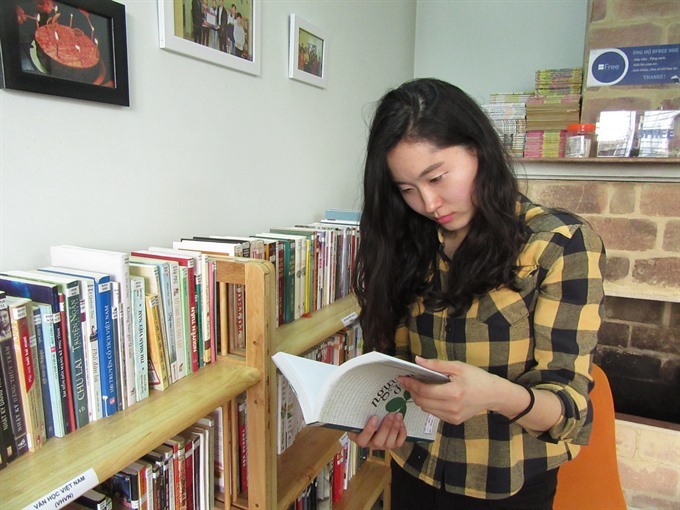 The library is also loved by Moon Jungbin, a young Korean woman who is studying a master’s degree in Vietnamese culture at the University of Social Sciences and Humanities. “I found this library online and was eager to visit. I was not disappointed as I found loads of good books that can help me improve my Vietnamese language,” she says. Although the library has achieved some success, Giang and his teammates are eager for more book donations, in Vietnamese and in other languages, from organisations and individuals.